Today I am very happy to host my closest friend Lizzi and her blog post on bullying. I want to start your day with a poem we wrote several weeks back. I saved it because I love the message and feel it represents a wonderfully compassionate attitude. We all have moments when we need someone to LOVE US ANYWAY! Beautiful and appropriate for the subject at hand. Actually it’s applicable to so much more. Beautifully written. Of course. It’s Lizzi! Thanks Cathy. Hasty and I wrote this together. I love poeming with her. Words a victim of bullying can hold on to. Sunset, my love, thank you SO much for writing with me. I love what we made. You both moved me so deeply with this. Thankyouthankyouthankyou! It can get under the fences we put up. There are so many ways we reflexively react against concepts and ideas. But art can dig right underneath, or fly right over, all those walls. I needed to read this. It can, and I think one of the things I love MOST about poetry, especially when I’m under an Attack of The Feels, is that in putting those awful things into something artistic and creative, it somehow redeems the awfulness, a little bit. Love it. That’s what it’s all about, right? Taking one another – and ourselves – as we are. Absolutely 🙂 That’s the idea, though it’s easier to write than to live, sometimes. Oh this is just beautiful in EVERY way. What a comfort. May we all be able to say these things… always. I know. It’s beautiful when you can say these things and mean them, and have them reciprocated. Thank you so much. We had a lovely time writing this. Something tells me you two should write more together. Powerful results here. I’m sure you are 🙂 You are worthwhile and from what I’ve seen, a wonderful, flawed, incredible, vulnerable, determined, strong, ShinyBright man. I’m glad to be making your acquaintance. I have chills reading this… this is what true love is. Gorgeous. HEY! How is it two months and I never saw this? Sorry G! You’re awesome. And Hasty’s taught me a lot about love. I’m learning so much from my friends. Today it’s to love extravagantly. I want to do that. Ah the two of you this is so totally beautiful. 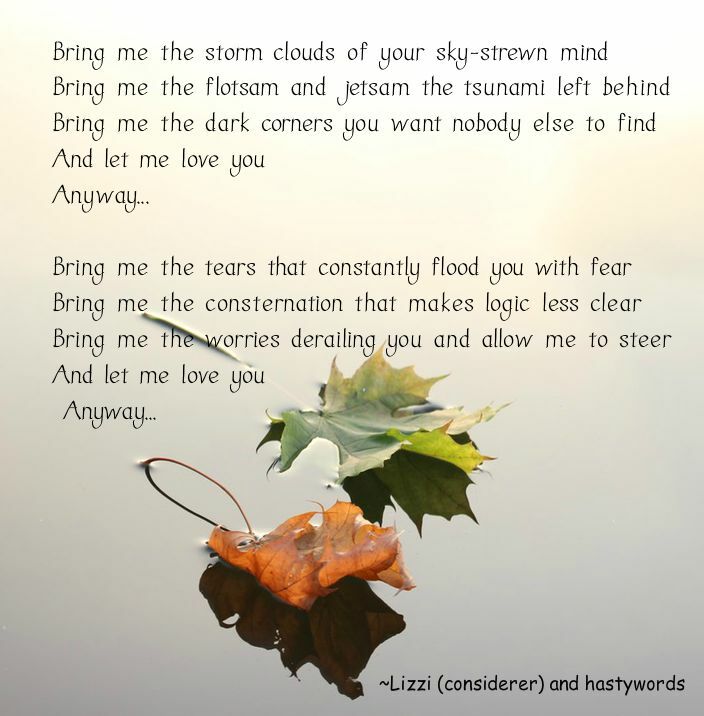 Hasty & Lizzi, you poerty utterly beautifully together. There are in this world so very many to whom such should be sincerely spoken. We have a long history of poetrying together, and it’s such a wonderful game and pleasure to do. I think the sentiments definitely go further than the two of us, but it’s like our little friendship commitment to one another, which I adore. I’m getting quite fond of the results. Thanks, Hasty for putting this up again – it still works. I hadn’t seen this before, so thank you for posting again. I loved every bit of this poem. The repetition of the lines reinforces that no matter what, they will always be loved. Ahhh… yes!